Some time ago, the council asked much known-about-town artist Fred Pipes if they could use some of his images to board over unused premises in the city. 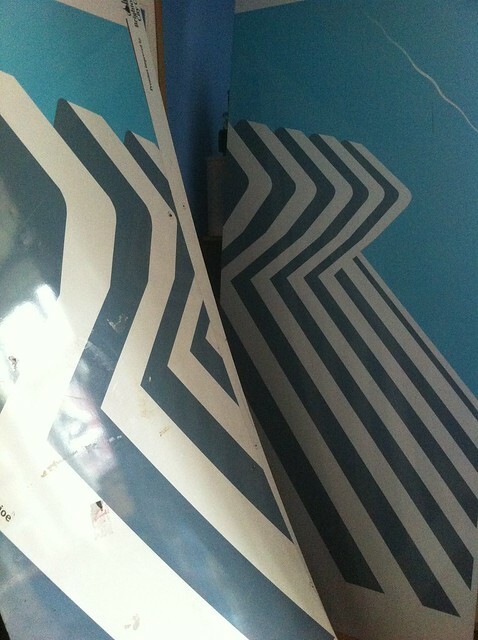 The result was a number of very large, laminated metal murals, showing his images of local art deco buildings. Last week, Fred posted on Facebook to say that the murals were coming down, and would anyone like them. He mentioned that they were large. Along with a couple of other people, we expressed an interest, and a van has just dropped off Embassy Court, in three metre-tall panels. Oops! There goes the decluttering. We're sizing up the flat to see where it can fit. The most likely contender is our bedroom wall. I think it'll look ace, but we'll have to rearrange some furniture, and possibly have a couple of bits in front of it. And when we move house, we'll make sure we buy somewhere with at least one big wall.